Mary Kay Dancy Smith of Jackson, TN, age 66, died Saturday, November 8, 2014. She was born April 26, 1948, to the late James Hughes and Frances Rhea Dancy. . Mary Kay was married in 1967 to Kenneth Radford Smith and on August 9, 1968, her son, Kenneth Rhea Smith, was born. Mrs. Smith was a member of First Baptist Church and was involved, with her husband, in Civil War Re-enactments. 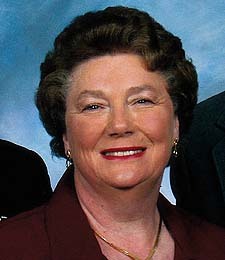 Mary Kay was preceded in death by her husband, Kenneth R. Smith, on November 7, 2006, and a sister, Peggy Jean Dancy Paschall. Survivors include her son; Kenneth: her brother, James K. Dancy; first cousins: Betty Byrd and Priscilla Stripling. Funeral services will be held at Lawrence-Sorensen Funeral Home Chapel, 403 E. Baltimore Street, Jackson on Tuesday, November 11th at 12:30 p.m., with visitation from 11:00 a.m. till 12:30 p.m.
Mary Kay was raised in Dancyville, Tennessee. She spent many days of her youth roaming the roads and hills of Dancyville. She had been active in the Dancyville United Methodist Church and support of the Methodist Cemetery. She also owned her family home which is located on the Dancy home place farm. With the loss of Mary Kay this web site will never be anything near the same. She had been the one that really supplied the information and kept things going through the years. While I have done most of the basic computer work on the site Mary Kay did the important part of the reporting by collecting the information and keeping the site up to date in the Dancyville area. She also did many scan projects and typing prep work. I have lost my work mate for the past 14 years. But more important I have lost another sister. We were not connected in the early years, since we lived apart, but we made up for it during the years that we did the Dancyville site.